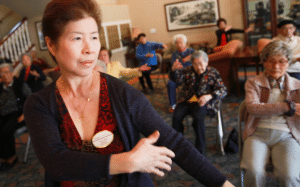 At left, Aegis Living residents focus on core strength and balance in Tai Chi class at Aegis Gardens in Fremont, CA. My dad teeters from the kitchen with his afternoon bologna sandwich and cup of hot coffee. Each step is slow and labored, as he maneuvers his way back to his favorite armchair and the television remote. He finds the side table to shakily set down his snack, then slowly turns and shuffles to back his way into the chair. He falls back with a heavy sigh. I watch anxiously, trying desperately to hide my tension. I want him to be independent but I fear the worst, as I watch his steps becoming more and more unsteady. On the other side of his armchair sits his walker, something he refuses to use because “that is for old people.” My dad is 90 years old. He has already fallen four times, that I know about. I worry about him every day. This story reflects the experience of many adult children as they watch their parent age and experience mobility issues. A fall for an elderly person is a great concern. Falls are the leading cause of emergency room visits in the United States for people 65 and older. Falls can cause many problems including fractured bones, lacerations, and even death. As your parents age, there are many factors that can contribute to their fall risk. Common sensory disorders, such as vision and hearing deficits, can affect safety and balance. Side effects and interactions of various prescriptions are other sources of risk since these issues can result in problems such as blood pressure fluctuations, confusion, and shortness of breath. Other major risks include musculoskeletal disorders such as arthritis pain, numbness in feet, decreased muscle strength, and gait abnormalities. Make a medical appointment. First consult with their physician. Provide their physician with a history of falls and include the details of when these have occurred. Discuss your concerns and ask the physician to do a thorough physical exam, including an evaluation of their judgment and mental status, and to review the medications (both prescription and over-the-counter). Ask for a good sensory evaluation that assesses vision, hearing and sensation. Partner with your physician on how to best assess, treat and assist your loved one with mobility concerns. Physical activity. Exercise can improve physical strength, flexibility and coordination. Ask the physician about exercise and discuss what type of exercise would be appropriate such as walking, chair exercises, swimming, or a low impact movement such as Tai Chi. Sensible footwear. Invest in appropriate footwear that fits properly with non-skid soles. Encourage your parent to avoid walking in socks, loose-fitting shoes, or heels. Make the home safe. Look for environmental risks in the home. Take inventory of your loved one’s home. Make sure there are clear, unobstructed paths to each room and keep necessities within reach. Secure rugs, move clutter, tuck away electrical cords, nail down loose floor boards, and place nonslip mats in showers and tubs. Keep the home well lit. Vision loss is common in the elderly and light sensitivity is reduced. Keep a lamp within easy reach of the bed and paths cleared to all light switches. Place night lights in the bedroom, bathroom, and hallway. Replace any broken bulbs immediately. Place a flashlight in an easy-to-reach place, in case of a power outage. Consider implementing assistive devices and make sure existing devices are working properly. A physician may recommend a walker or cane to help steady ambulation. Walkers should be properly fitted to the user, and canes should have a rubber grip. Other assistive devices that may be helpful are handrails on both sides of stairways, a raised toilet seat with a riser and supportive arm rests, grab bars in the bathtub or shower, treads on wooden steps, or plastic seats with handheld shower nozzle for seated bathing. Alert Device. If your loved one should fall, they need to have a way to summon help. Wearing an alert device will allow them to get aid if they fall and cannot get up. They may also choose to carry a cell phone or cordless phone from room to room. Not all falls can be prevented, but precautions can help make the individual as safe as possible. Taking the time to create a plan will go far to maximize your loved one’s independence. Regardless of corrective measures, safety needs and physical care may be too challenging for an older person and in-home caregivers. In some cases, families may find assistance and comfort in moving their loved one into an assisted living community that can provide care staff to assist with walking, transferring, and toileting. At Aegis Living, our hallways are designed with lovely chair-rails that may seem to be part of the décor, but in fact can serve as handrails to assist walking within the building. No company can guarantee fall prevention, however having trained staff and design features to assist people can reduce the risks. Our communities provide 24-hour care staff, open walkways, elevators, good lighting, accessible bathrooms, and large spaces designed to accommodate walkers and wheelchairs. Please feel welcome to tour one of our communities to learn if Aegis Living might offer support to ease your concerns.